Stephen has been carving his whole life. Carving is it for him. His knives appear on the cover of Blade Magazine. 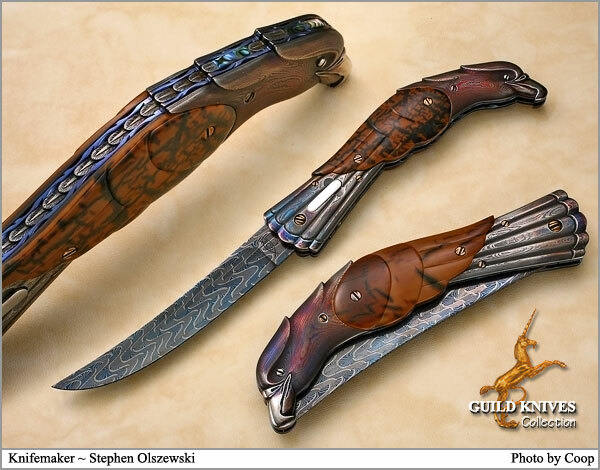 For the last 11 years, he has focused on Art Knives. He has carved some masterpieces, for example, look at this sculpture. No one, but no one, is doing it better. Wonderful Damascus Wings are carved in Mammoth Ivory. Individual feathers are carved along the full backspine, and an Abalone inlay and a feather are carved inside the knife. A Masterpiece.